Venerable Brother Sparky has an unhealthy obsession with Tyranids. Mostly because they are the ones that put him in his metal prison. 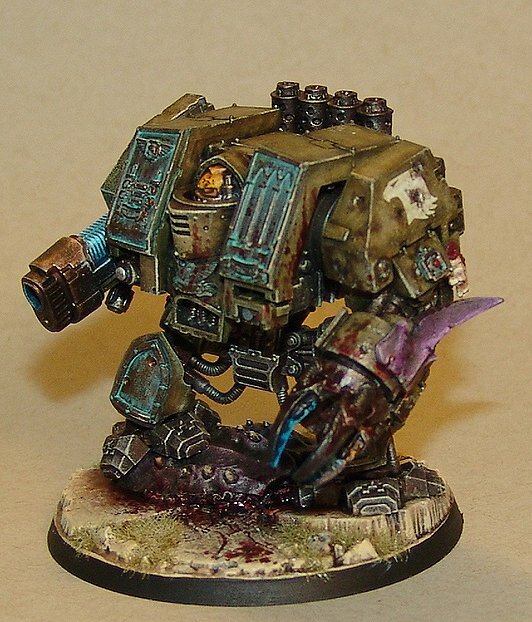 In fact, he thinks he's fighting Tyranids all the time, no matter what enemy he meets on the field. 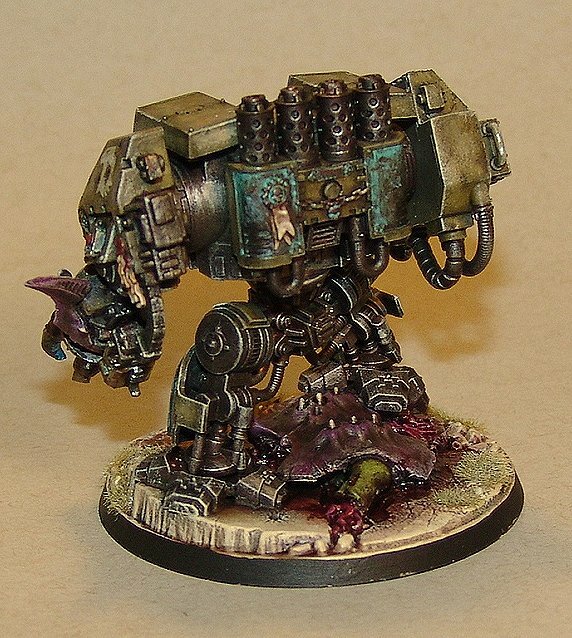 His Plasma Cannon is ancient and unreliable on a good day, but he has no problem getting up close and personal if the old girl isn't up to the task. So... the Venerable Dreadnaught is DONE.... we'll see how far I get with the Ironclads. That's all for now. Cheers Ya'll! Wow! That was fast. I didn't even know you were doing one. I love me some Raptors, and I'm really digging that bronze. Care to share your recipe for the patina, maybe? Looks like it could be Nihalakh, but I love the stippled/mottled appearance. Also, in some places I did layers of washes. One of the beautiful things about acrylics of any kind, especially on a 3D surface like models, is that you should never be afraid to layer washes or watered down paint. You can really get some neat effects that way. Of course the best way to find such things is trial and error.... and painting a LOT. Yeah, thanks for the reply. It's the 'rubbed out' look that I have trouble duplicating. Maybe I should actually wipe it away, but I'm always worried about wiping the paint into other areas. Maybe I should start doing the bronze first. For my army, I think of the bronze more like oil-rubbed or polished bronze, as opposed to old pennies or statues. There's still patina in the cracks, but the raised edges are more of that coppery color. Anyway, it's really working on this guy. Love the effect. What I do for bronze is start with a dark brown/black 50/50 mix, then a quick dry brush of Warplock Bronze (used to be Tin Bitz), then I do my patina. For what you are describing it'd be mostly in cracks and creases, if you use a thin liner brush with the Technical medium it'd work nice. 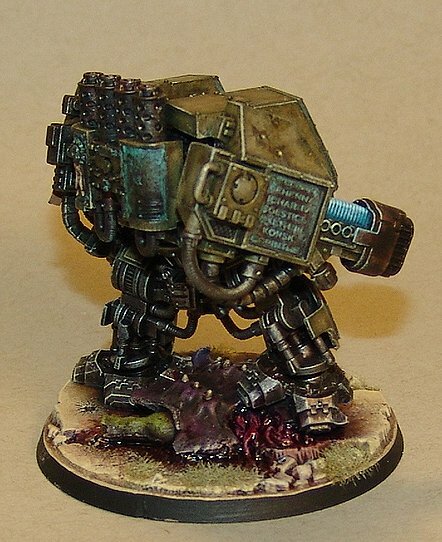 You can stipple in the dark brown, then some of the Warplock, then a brighter bronze on the raised areas, then mix that bronze with a bit of silver for highlights. Real bronze goes from shiny, to dark to dark brown if its not polished well. 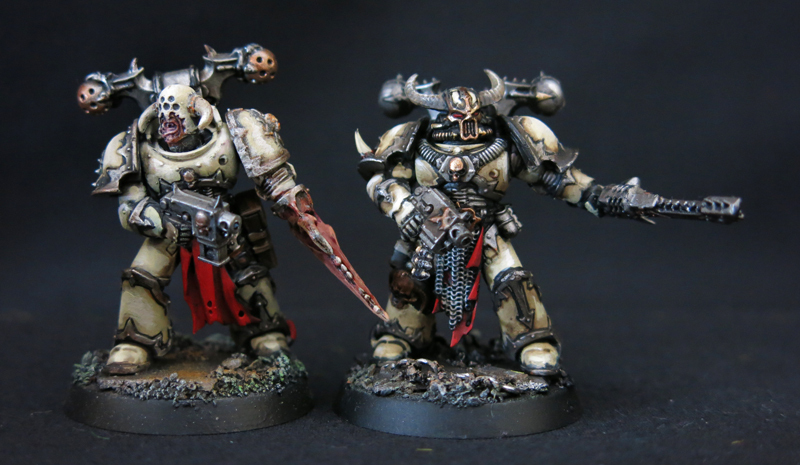 That flat dark brown can really add a neat visual element and depth to the bronze. I'm going to do a squad of Greco-Roman type marines (eventually) I'm kind of stoked to try playing with the more polished bronze after doing the patina. Fantastic work! I to really love the patina! It looks correct, which is hard to do. Thanks for the tips in the conversion you had with Jeff! 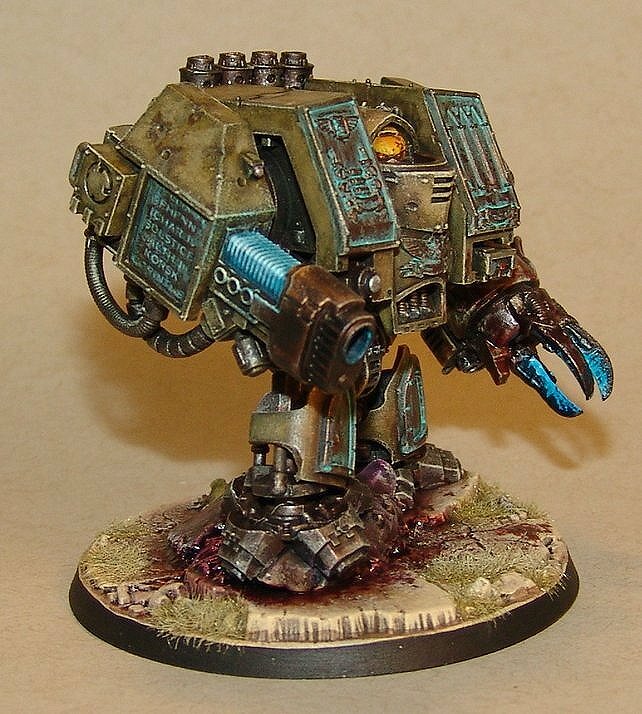 I got the one done I wanted for Dreadtober, now lets see if I get anywhere with the other 2. I'll definitely finish one of them, though it may not be by Halloween. The 3rd one, I'm noticing needs some additional work. Awesome looking! I really like the added Nids bits ... gives it a lot of added flavor! One of these days I'll work on my nids. I kinda did that scheme off of the color wheel when I was looking for something to compliment the Dread and I like it. It may have pushed me over the edge, since I've been waffling between cockroaches and blue crabs for inspiration. Beautifully done! 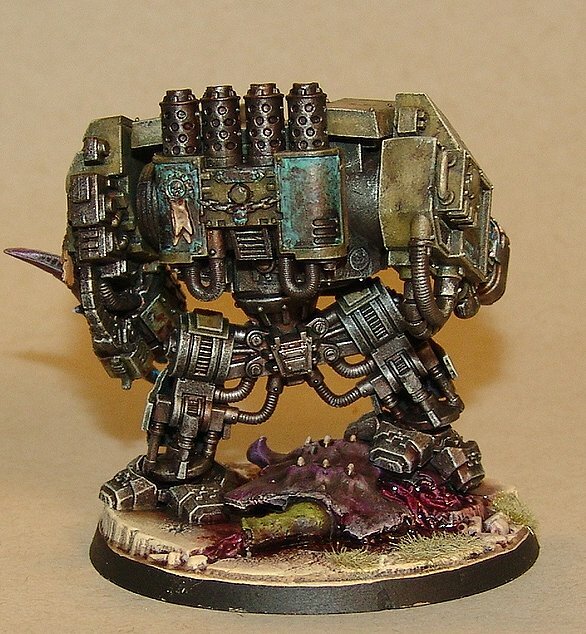 The verdigris is wonderful, and I really dig the conversion work - really gives it a storied look! Thanks all! I appreciate the comments. 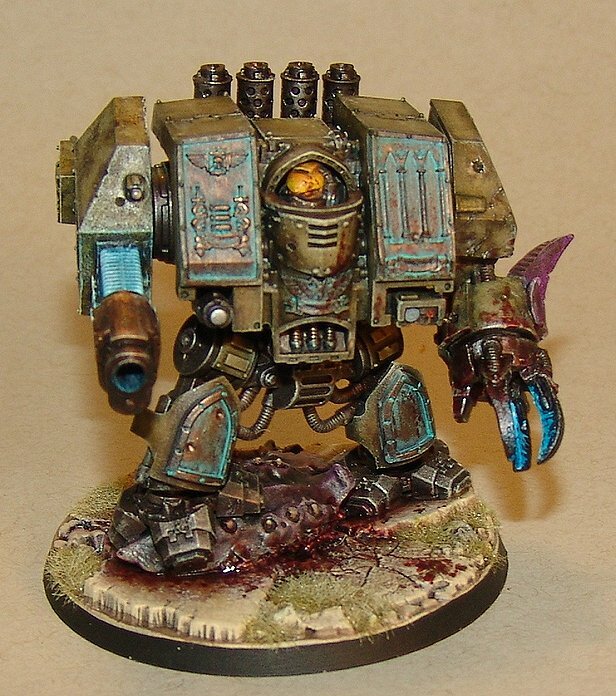 Dreadtober: In Progress Part 2.